Tech Bloggers @ Davos: Veni, Vidi, Blogi! 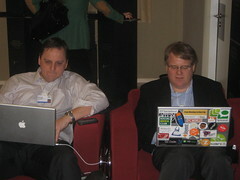 Mike Arrington & Robert Scoble conquer Davos, news @ 11. Dave, I liked your candid note (so jealous!). I hope you will get an invite soon..
would be interesting to know how many people form bay area are in Davos this week?